2015 was a packed year with the launch of several exhibitions, special projects, film screenings, lectures, performances, workshops and children's programmes which we are delighted to share with you below, as we look back on a rich and fulfilling year. There have been several exciting developments such as the expansion plan for a new wing and the Museum's participation at the Delhi Art Fair. In addition to all the public events and activities, the Museum has been consistently working to research and digitize its collections and during the year we have completed detailed documentation of our collection. The Museum has collaborated with Google to allow the visitors to virtually explore the Museum from anywhere. We would like to thank you for your support which led to my nomination for the Mumbai Heroes campaign by the Mumbai Mirror. We hope that you will continue to frequent the Museum and participate even more enthusiastically in our activities. I would like to appeal to you to show your support, by becoming a friend of the Museum through our 'Friends of the Museum' programme listed in this newsletter, and follow us on social media for our latest updates. We are very excited to announce that the Dr. Bhau Daji Lad Museum is now accessible online on Google Cultural Institute. The Google Cultural Institute is a unique tool by Google giving users the ability to experience a ‘virtual tour’ of some of the best museums across the world. It has put the world’s cultural treasures at the fingertips of internet users and is viewed by over 51 million people. After an extensive two-year effort by the Museum team in collaboration with Google, more than 200 highlights from our collection as well as contemporary art exhibitions can all be accessed virtually. The Museum View Feature allows a 360 degree virtual tour of the Museum. Specially curated virtual exhibitions tell the story of the restoration and revitalisation of the Museum, as well as important contemporary art shows like '7000 Museums: A Project for the Republic of India' by Atul Dodiya and the 'ZegnArt Public/India' artwork by Reena Kallat and 'This Too Shall Pass' by Sudarshan Shetty. Get up close with ultra-high resolution images as Museum collections can now be viewed in never-before-seen definition thanks to the Google Cultural Institute’s zoom features. Users can explore it in extraordinary detail and experience it far beyond what is visible to the naked eye. This initiative will make BDL’s collection and exhibitions accessible to people around the world who do not have the opportunity to travel and visit the Museum. Mumbai Heroes, a campaign by the Mumbai Mirror, celebrated citizens who have pioneered projects that benefit the people of Mumbai and have made a substantial difference in the city. The campaign aimed to pay respect to these crusaders, who are making this city and nation a better place to live in. Mrs. Tasneem Zakaria Mehta, Managing Trustee & Honorary Director of Dr. Bhau Daji Lad Mumbai City Museum, was nominated as a Mumbai Hero for not only restoring the once derelict Museum building, but for its revival as a cultural hub. The exhibition presents vintage silver gelatin portraits by J.H. Thakker(1923 - 2003), founder of the iconic India Photo Studio, Mumbai. He moved to Bombay during partition from Karachi, and set up the India Photo Studio in Dadar next to the Chitra Cinema. Thakker was one of the pioneers of the studio photography tradition in India and his portraits created the public image of the Bombay film industry in its golden period in the 1950s and 1960s. 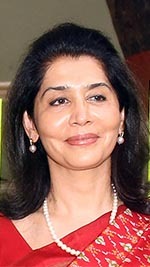 Several icons of the industry are presented including Raj Kapoor, Waheeda Rehman, Nargis and others. Unique photographs, documents, and ephemera in this exhibition highlighted historical interactions between Americans and Indians from the late 18th century to independence in 1947, which featured early commerce, cultural, ideological and philosophical connections as well as leadership exchanges, World War II, and more. The exhibition presented vintage photographs produced by Bourne & Shepherd, the oldest surviving photo studio in the world, which is still operational today under the same name, in Esplanade, Kolkata. The exhibited photographs were not only important cultural historical artefacts from the 19th century, providing viewers with a glimpse of an alternate time, but also illustrative of the much praised picturesque style of the Bourne & Shepherd Studio. ‘Woven Wonders of Varanasi' marked the launch of an initiative where eminent designers paid homage to textile artisans and their craft. The exhibition brought together India’s talented weavers and fashion designers, to pay tribute to the Banarasi textile industry. -in-cheek references to colonial history. "Country of the Sea" was an exhibition bringing together CAMP’s long term maritime world project in and around the western Indian Ocean. This was the first presentation of the project in Mumbai. The center-piece of the exhibition was the India premiere of CAMP’s much-travelled film From Gulf to Gulf to Gulf, presented in the heart of the Museum, transforming its historic environment into a cinematic space. An unusual map was especially created for the show by CAMP in collaboration with young artists. The map locates the Asian subcontinent in close proximity to the African subcontinent as if the two are in the process of separating due to tectonic upheavals, and suggests the many shared histories that give the exhibition its title. 7000 Museums: A Project For The Republic Of India, was a comprehensive body of artworks, with oil paintings, water colours and sculptural assemblages. The exhibition involved nuanced readings of the Museum’s collection and referred to defining moments of the nation’s history, art history as well as the semantics of museums and museum displays. Atul addresses the complexity of various simultaneous happenings in history - of politics, art and culture, through playful interventions in his works. He assembles an encyclopaedic vision of potentialities where mythical figures take on a contemporary characterisation invoking the theatrical models and dioramas in the Museum, as seen in the vitrine installations that were displayed in the centre of the Museum. The installations nudge painterly references from Tagore, movies and great artists Atul admires, images from a personal history, or the popular kitsch that abounds in Mumbai’s markets. "It is a wonderful museum and the way it is restored is beyond imagination. The very rich building with interiors makes it unique and the objects telling a story line is also an interesting way to display." Chamba Rumals are traditional embroidered square cloths from Chamba in the state of Himachal Pradesh. A skillful blend of the Pahari miniature painting tradition and embroidery, Chamba Rumals have been called ‘Paintings in Embroidery’.This craft was near extinction when the Delhi Craft Council took up the challenge of reviving the art. After a detailed study of old rumals in the collection of various Museum across the country and abroad, a collection of selected rumals have been re-created by the artisans from Chamba and were exhibited at the Special Project Space. ‘Winter.’ by Julian Opie centres around a sequence of seventy-five prints that represent a circular walk taken by the artist through the French countryside. The prints absorb an eclectic range of influences, from 17th century Dutch landscape painting to street view on Google Maps, and are at the forefront of Opie’s continued investigation into the experience of landscape. Photographer Nemai Ghosh has been the quintessential Satyajit Ray biographer through his decades-long association with the master filmmaker. The exhibition attempts to bring to light Ghosh’s lesser-known but extensive documentation of cinema, comprising mainstream Hindi cinema from Bombay as well as regional Bengali cinema. Several iconic and never-before-seen images of actors, scenes, sets and locations taken over a twenty-five year period were featured in the exhibition. Mumbai-based artist Valay Shende’s life size works represent objects and situations around us. Valay Shende constructs metal sculptures of everyday forms like life-size trucks, buffalos, tiffin-carriers and scooters, as symbols to reflect on societal issues such as migration, plight of farmers and social divides through caste and poverty lines. As part of the show, a large metal sculpture of a truck with migrant construction workers, titled ‘Transit’ was displayed at the Museum’s Plaza. Sebastian Cortés’ series, ‘Sidhpur: Time Present Time Past’ forms the first in-depth photographic exploration of the Bohra Islamic community in Sidhpur, a little-known small town in Gujarat. Cortés was intrigued by Sidhpur’s rich heritage and distinctive vernacular architecture. The photographs capture the extraordinary juxtaposition of European influenced architecture and Indo-Islamic interiors. The Museum has embarked on an ambitious expansion plan to develop a new wing on the north side of the existing building. The project is supported by the Municipal Corporation of Greater Mumbai and will be undertaken on a public-private partnership basis. The new Museum wing aims to become the primary centre for the contemporary cultural development of Mumbai. The iconic new building will put the Museum at par with leading museums across the world. On 10 March 2015, Steven Holl, the winning architect for the Museum expansion project, considered to be one of America's most important architects, engaged an audience of over 500 people, as he discussed his winning proposal for the new Mumbai Modern wing for the Museum. Widely recognised for his ability to blend space and light with great contextual sensitivity, he employs local influences into a poetic architectural language in each of his projects, to create a unique concept driven design. Steven Holl has been recognized with architecture's most prestigious awards and prizes. The Museum is delighted to announce a collaboration with the Cobra Museum of Modern Art, Amstelveen, which will focus on an exchange of exhibitions, workshops and education programmes for young people. The partnership was launched at a special event hosted by the Museum and attended by Mr. Eberhard van der Laan, Mayor of Amsterdam along with Ms. Mirjam van ‘t Veld, Mayor of Amstelveen, the Consul General of the Kingdom of the Netherlands, Mr. Geoffrey Van Leeuwen, Mrs. Els Ottenhof, Executive Director, Cobra Museum of Modern Art and Mr. Frans van der Avert, CEO of Amsterdam Marketing. As part of the celebration, The Royal Concert Orchestra ensemble from Amsterdam performed at the Museum for their very first time in India. An artwork by Karel Appel was unveiled and displayed for the evening. Karel Appel was a founding member of Cobra, a European avant-garde movement. The name was coined in 1948 from the initials of the members' home cities: Copenhagen (Co), Brussels (Br), Amsterdam (A). Heralded as the last avant-garde movement of the twentieth century, the movement was active from 1948 to 1951. The movement saw artists join forces to create work which reacted with a distinct political and social agenda to the post-World War II condition in Europe. It sought to redefine the role of art and engage the community in meaningful ways to mitigate the trauma in the aftermath of the War. Now beginning its fifth year, the year-long weekend course covers the theoretical and critical study of the history of Indian Art from 1850 to the present. It enables students to understand Indian art in the broader context of Indian history, sociology, politics, gender and cultural studies. The course further explores new readings of Indian Art within the context of international modern and contemporary art history. From January 2014 the Museum introduced a new Curatorial Studies segment in the course programme. This format helps participants engage with concepts associated with curatorial practice as well as provide students with hands-on exhibition and conservation experience using the Museum as a resource. The Museum participated for the first time at the India Art Fair 2015 in Delhi, where we showcased the design by architect Steven Holl for the development of the new wing at the Museum. The India Art Fair is the country’s largest art event and is visited by over 100,000 people each year. The Museum’s presence at the India Art fair generated a greater awareness about the Museum and its activities among the large number of visitors. 23-25 July 2015, Mrs. Tasneem Zakaria Mehta, Managing Trustee & Honorary Director of Dr. Bhau Daji Lad Mumbai City Museum was invited as a speaker at Experimenter Curators' Hub, Kolkata. Mrs. Mehta’s talk titled, ‘Insurgent Acts’, presented the Museum’s ongoing contemporary exhibitions series called ‘Engaging Traditions’. The Museum’s intention is to redeem this historical imbalance by foregrounding local art practice. The curated series Engaging Traditions, invites artists to respond to this history of eliding and manipulating identities. Several distinguished contemporary artists including Sudarshan Shetty, Jitish Kallat, Sheba Chhachhi, L. N. Tallur, Atul Dodiya and CAMP have participated in this programme. The Dr. Bhau Daji Lad Museum partnered with the Kahani Karnival Trust to organize and present a first of its kind children’s literature festival, the Kahani Karnival, at the Museum, once every quarter in 2015. 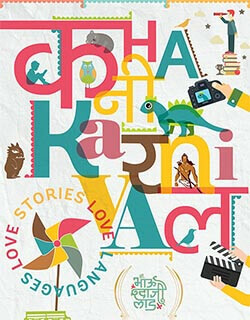 The Kahani Karnival Trust is a not-for-profit organization working to spread the joy of reading and to bring alive stories through books, theatre, art, music and dance. The Museum provides a platform that brings together children, educators, parents, authors and creative artists through on-ground festivals and events at schools. The partnership was inaugurated with a mega festival held Friday, 16th and Saturday, 17th January 2015. The festival was a presentation of multidisciplinary art forms and included sessions such as ‘Museum of Me’ inspired by Atul Dodiya’s exhibition, an animated reading of ‘Gajapati Kulapati’ by dancer & story teller Mirabelle D’Cunha, a walking tour of Rani Bagh with Katie Bagli, and a special play called ‘Dhara ki Kahani’ that highlighted the importance of recycling. This edition saw approximately 1500 people participating over two days. On April 26, 2015, the Museum hosted Chhoti Kahani Karnival, a Story-telling and Theatre Gala with performances and workshops. Currently gracing our café wall is a collage hand made by children who participated in Windows, a mixed media mural workshop where young storytellers were encouraged to weave a sea of tales that re-imagine the city they live in. The third edition of Kahani Karnival took place with ‘Languages’ as the theme. 28-29 November 2015 saw the Museum Plaza transformed into a carnival of dance, music, storytelling and more. Workshops were conducted by incorporating various Indian languages and included readings by authors, story-telling through found or everyday objects, puppet making, gardening, comic making, and lots more. Over 500 people participated in the programme. The Museum conducts open to all, public lectures every Saturday by eminent faculty of the PG Diploma course. The visiting faculty, who are renowned art historians, researchers and art practitioners, lecture on a range of cultural issues in an effort to bring about a conversation about culture among the city’s community. This year the Museum continued to host scholars such as Shukla Sawant, who analysed the the representation of landscapes in the works of Santiniketan artists, Professor Parul Dave-Mukherji, who spoke about the connections between artists, ethnography and archive, and Professor Jyotindra Jain, who did a comparative analysis of the Goddess figure and its subsequent visual representation in art and ritual practices. Several important international academicians are invited by the Museum to present public lectures. We were delighted to have Ethiopia-based Meskerem Assegued, anthropologist, curator and writer with a special focus on the environment, share her experiences of curating African Art on the world stage, in Contemporary Art and Anthropology. Assegued is the founder of ZCAC (Zoma Contemporary Art Center), an artist residency located in Addis Ababa and Harla, a small village south of Dire Dawa, Ethiopia. We also hosted lecturers such as Dr.Irving Finkel from the British Museum, who spoke on the history of board games in India, and Matt Packer, the Director of the CCA Derry~Londonderry in Northern Ireland, who focused on contemporary curatorial practices in Northern Norway and Ireland. Free public tours are conducted every weekend by a member of the curatorial team. The tours encourage visitors of diverse backgrounds, age and interests to engage with the Museum collection, history, architecture and contemporary exhibitions. No prior registration is required, tours are conducted every Saturday and Sunday in English, Marathi and Hindi. In addition to the free tours, private groups may book themed tours on request and for a fee. Particularly popular are tours that focus on the history, development and cultural heritage of Mumbai. Groups may also book interpretive tours of the Museum’s temporary special exhibitions. Once a month, the Museum invites young, skilled professionals to lead intensive workshops for adult audiences. Participants benefit from their expertise and experiment with a new art form to develop new skills and leave the Museum feeling inspired. In the past year, sessions on creating comics, shadow boxes, pottery and clay modelling Calligraphy and Caricature sketching have been very well received. Heritage walks with a focus on photography were also conducted by a professional photographer, which were especially popular. The Museum invites college students and young adults to engage with its collections, history and exhibitions through interpretive gallery tours and workshops. Especially popular are sessions focused on the history and heritage of Mumbai, decorative art traditions and contemporary art practice, using the Dr. Bhau Daji Lad Museum as a case study. The Museum conducts workshops for children, schools and NGOs with interactive tours and discussions focused on a particular display or collection, followed by an associated creative activity. Popular workshops inspired by our permanent collection include silver-work, pottery, mapping memories and spaces, Ragamala painting, and puppet making. The Museum offers children the opportunity to critically and creatively engage with permanent collection, as well as special contemporary exhibitions through specially designed worksheets, interpretive gallery visits and workshops. The Museum’s workshops cater to a diverse range of audiences and worksheets are available to the participants in English, Hindi and Marathi. Every weekend in May, the Museum’s education team hosted a range of exciting holiday activities for the entire family. Children explored exhibitions, played games, took a heritage walk, and even tried their hand at conservation, puppetry, pottery, mapping, role-playing and building dioramas. On May 2 & 30, 2015 in relation to artist duo Thukral and Tagra, exhibition ‘Games People Play’ the Museum hosted a Games Mela. Visitors participated in T&T’s customised games, Walk of Life, Verbal Kabbadi and a very special version of Table Tennis. The Museum Plaza turned into a play-ground for games inspired by the Museum’s collection of traditional indoor and outdoor games, such as a life sized game of ‘Snakes and Ladders’. On 8 September 2015 the Museum co-hosted a performance by Diane Ferlatte, an internationally renowned storyteller, who received a Grammy Nomination in 2008. Diane believes that telling and listening to each other’s stories not only enables us to learn about each other, but also to understand each other better. The event was attended by over a 100 people, children and adults alike. Starting in July we have had special screening for children once a month, on Sunday. Each festival features films specially selected to engage young audiences and families alike, with stories from across the world, told through both animation and live-action. These films are screened in collaboration with the Consulate General of Canada, Mumbai. On 30 August 2015, children explored the history of the city through the art, maps and dioramas on display at the museum. They created their own characters, plot and setting and wove all these elements together to pen a unique work of historical fiction. This programme was conducted on a quarterly basis, in collaboration with The Writer's Bug. The Museum runs a vibrant film programme with regular film screenings at the Education Centre. Launched on April 3rd 2015, 'Movies at the Museum' is a monthly screening programme, curated by filmmaker and cinematographer, Avijit Mukul Kishore, and architect and urban designer, Rohan Shivkumar. The programme includes films and videos made in different genres – documentary, fiction, animation and visual art. Film, art and academic practitioners are invited from time to time to engage in discussion on their work. The screenings are free and open to public. The launch edition was themed around Dadasaheb Phalke. A short film on Dadasaheb Phalke was screened, followed by a screening of Rangbhoomi by Kamal Swaroop who was present to introduce and discuss the films. The launch was attended by over 200 people. On May 1st, Maharashtra Day, the Museum screened 2 Marathi films by V Shantaram followed by a discussion on the films with film historian, Prof Suresh Chabria. Further Movies at the Movies screenings included films and guest speakers: ‘Olympia’ by Leni Riefenstahl with George Jose, ‘Unknown Territories: Radical Cinema 1963-2012’, a special curated screening by Ashim Ahuwalia, ‘Diamond Queen’ by Homi Wadia with Paromita Vohra, ‘Notes for a Film on India’ and ‘Phantom India’ by Pasolini and Louis Malle discussed by Girish Shahane. The film programme is very well attended with an average of 80 people for each screening. The Museum hosted a special event organised around Atul Dodiya’s exhibition, 7000 Museums, as part of Mumbai Gallery Weekend, January 14th - 18th, 2015. Guests from the art fraternity were treated to a private artist’s walk through of the exhibition followed by a conversation between Dodiya and Museum Director Mehta. The Museum was a venue partner for FOCUS Photography Festival 2015. The ‘Call for Entries’ exhibition was hosted at the Museum Plaza, between March 12 – April 10 2015. Out of 126 international submissions, 20 photographers were selected by the jury around the theme ‘Crossovers’. About a hundred photographic prints were on view at the Museum Plaza on specially designed outdoor display structures by the FOCUS team. Curatorial walks and talks were held around the festival. The Museum hosted an academic seminar, titled ‘View From The Boat’ inspired by the artist group CAMP's extensive maritime-world exhibition, As If III - Country of the Sea, which was on display at the Museum between February 22 - April 7, 2015. Eminent historians and scholars from India and the UK participated. 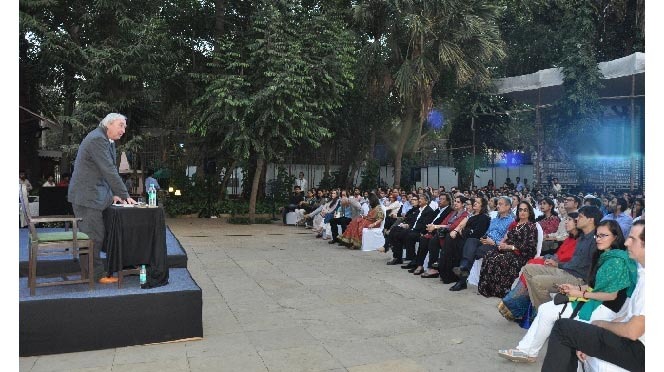 A mini retrospective of Kumar Shahani's films not seen in recent years in Mumbai and the launch of Shahani's book ‘The Shock of Desire and Other Essays’ took place at the Bhau Daji lad Museum on the 5th of December 2015. At the day-long programme, Shahani’s films Tarang, Maya Darpan and Khayal Gatha were screened accompanied by conversations with Ashish Rajadhyaksha, Rajat Kapoor, Arun Khopkar and Praba Mahajan. The book The Shock of Desire and Other Essays was launched by Tasneem Zakaria Mehta, Arun Khopkar and Ashish Rajadhyaksha with Kumar Shahani on skype. The programme was well attended with an audience of over 200 people through the duration of the day. On October 11 , 2015 the Museum celebrated the International Day of the Girl Child with a special screening of two films for children. ‘Hannah’s story’ by Juanita Peters, is a story of an 11-year-old girl who possesses an extraordinary can-do attitude and inspires even adults to make a difference. This was followed by an animated story, ‘Molly in Springtime’ by director Pierre-Luc Granjon. The screening, was held in collaboration with the Consulate General of Canada. On the occasion of World Heritage Day on 18th April 2015, a tour of the Chhatrapati Shivaji Terminus (CST), the erstwhile Victoria Terminus, a World Heritage Site, was conducted by renowned conservation architect and Co- Convenor INTACH, Greater Mumbai Chapter, Vikas Dilawari. The participants explored the history and architecture of the iconic nineteenth century structure, which is a fine example of the blend between Gothic Revival and Indian Traditional architecture, unique to Mumbai. The tour ended with a visit to the mini Railway Museum which encapsulates the history of CST. The tour was organized with INTACH, Greater Mumbai Chapter. A talk and screening of ‘Tate Shots’, short films on contemporary British art was held on 3 September 2015. Before the screening Museum Director Mrs. Mehta and ​Sharon Memis, Director West India - British Council, engaged audiences in a conversation about well known artist Julian Opie’s ongoing exhibition at the Museum titled ‘Winter. David Garnett, Deputy Visual Arts Workshop Manager, British Council, lead an informal session on the installation and de-installation of artworks. He spoke about the exhibition design and planning process prior to an actual installation, preparation for an installation, as well as the care and maintenance of art works. Several curators, gallerists and students from across the city attended. Kaiwan Mehta, architect and urban researcher, guided participants on a tour to witness the culture and architecture at Bhuleshwar in Mumbai. Kaiwan Mehta has done extensive research on the area that culminated in the book ‘Alice in Bhuleshwar’. He spoke on the original native town and the intricacies that make it vulnerable today. The walk was organized by INTACH. The Museum is delighted to announce the launch of its ‘Friends of the Museum’ programme. The FoM programme attempts to engage audiences in an exploration of the city’s artistic and cultural history. The programme offers Individual, Family and Corporate membership options, each with its own range of benefits and opportunities. Through the FoM programme, the Museum aspires to provide a unique platform for interested individuals to become culturally engaged and create a dedicated support base for the Museum and its activities, as well as revitalise the cultural discourse in the city. The revamped Museum Shop boasts of a wide variety of new products including artist books, notebooks featuring retro drawings of everyday occupations in their 19th Century avataars, like the Ramoussie (Watchman), Ayah (Nanny) or the ever popular Machi-wallah (Fisherman), and postcards featuring old product advertising. Beautifully crafted bronze Ganesha's make a wonderful addition to your temple, desk or as a gift to close friends. Made by a national award-winning craftsperson, Mumbai's favourite god is cast in the age old lost wax technique. Also, look forward to new customised products on your next visit. 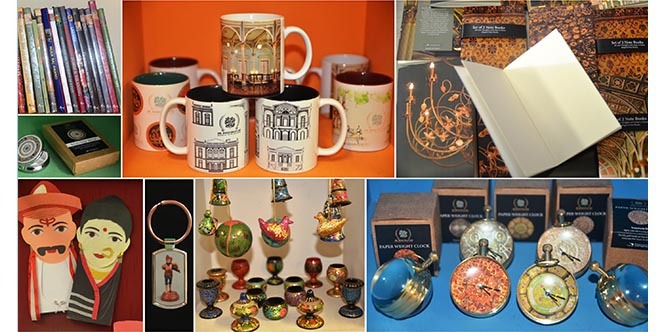 Inspired from the Museum’s collection, the customised range includes paperweight clocks, notebooks, fridge magnets, coasters, key-rings, t-shirts and more! Copper Medal ‘1862, LONDINI HONORIS CAUSA’, from the Museum collection. Several objects, rare books and paintings from the collection were carefully restored by the Museum's Conservation Centre in 2015. One of the important restored objects is a copper medal from 1862. The round copper medal with beautiful low relief images had tarnished and its bright pink colour had darkened as a result of dust, dirt, fingerprints due to handling, and harmful gases from the environment. Previously there had been several attempts to clean it with commercially available abrasive materials and layers of deposits had settled in the grooves along with the greenish corrosion. Treatment: After written and photographic documentation, the tarnishing was removed with specially made mixture of solvents. Working under a microscope, conservators carefully pricked and removed the deposits from the grooves on the medal. Care was taken not to abrade or scratch the soft metal. The medal was dusted with a soft nylon hair brush and cleaned again using solvents. Finally, a protective coating was applied to keep it safe from dust, dirt, environmental gases and handling.